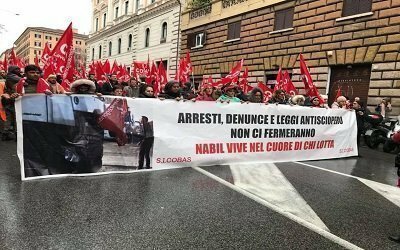 [APPEAL] The strike and freedom of trade union initiative aren’t matters of criminal law – "TOCCANO UNO TOCCANO TUTTI"
The strike and freedom of trade union initiative aren’ t matters of criminal law . In defense of the SI Cobas national coordinator Aldo Milani, for whom a sentence will shortly arrive with a sentence of 2 years and 4 months . In defense of trade unionists and solidarity affected by repression . This appeal is addressed to all the exponents of the legal , academic , art , culture and entertainment worlds , and to all the activists who , on the trade union , political and social level , share the text and the purposes , so that they offer their support to Aldo Milani , national coordinator of SI Cobas , unfairly accused of extortion following a cycle of strikes in the meat slaughtering sector in the province of Modena , and against which the PM has requested a sentence of 2 years and 4 months in the process that will will conclude at the end of March , and to all trade unionists and activists affected by the repression , on trial or subject to restrictive measures following strikes and labor unrest . 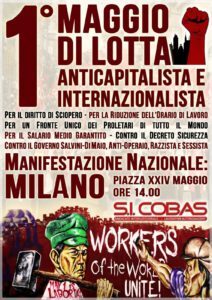 For about ten years the world of logistics, one of the key sectors of the Italian and world economy , has been crossed almost every day by strikes and labor unrest . Contrary to what happened in the last century , when the workers’ movement was almost always mobilized to win laws and contracts for improvement over those already in existence , in the logistics sector the unrest was triggered by a status quo characterized by a clear and systematic violation of Collective Agreements National workplaces and the most elementary legislative protections regarding wages , timetables and security . This movement, regardless of whether or not it shared the practices adopted and the methods of struggle and bargaining with the other party , had two undoubted merits: on the one hand it restored rights and dignity to thousands of workers ( mostly immigrants ) until then voiceless , in fact reduced to a condition of semi-slavery , underpaid , blackmailed , subject to inhuman schedules , rhythms and workloads , deprived of the right to leave and sickness, often defrauded of severance pay and deprived of any protection and /or union representation ; on the other hand it has brought to light a thick and intricate undergrowth of lawlessness, tax evasion , piloted bankruptcies, speculation and infiltration of organized crime , made possible by fierce competition between large, medium and small companies in the name of the grueling and unbridled chase to reduce costs . This system has found in the cooperatives and in the wide fiscal and regulatory facilitation provided for in our legislation for this ” business name ” , the key instrument to give life to a real jungle of contracts and subcontracts, often entrusted to ” spurious ” cooperatives whose operational and labor management methods faithfully follow the system of illegal hiring that the labor and farm laborers of the last century outlawed as a result of long and bitter trade union and political battles.In this context , it is no coincidence that our penal system still considers illicit labor inter-mediation and the exploitation of labor in the category of ” crimes against the person and against individual freedom ” ( art . 603 bis of the Criminal Code ) , providing for these punishments adequate sentences, even if then it is very rare to see them actually applied . The logistics workers movement , extended in recent years to important agribusiness , ceramics , trade and metalworking industries, is today one of the clearest examples of how the distance between formal law and substantive law is increasingly marked : in these years Police Headquarters and Prefectures have too often faced strikes and labor unrest ( almost always promoted by SI Cobas and Adl Cobas ) transforming them into a mere “problem of public order” , underestimating or ignoring that context of illegality , super- exploitation and abuses that leads to such unrest. The paradox of what is happening is that in many of the main supply chains of logistics , only thanks to certain forms of struggle , which in some cases are considered illegal, ( blocks at the gates , spontaneous demonstrations that end up blocking the access roads to the warehouses , sudden strikes ) it was possible to bring legality , to enforce the laws of the State in the field of labor rights , security , compliance with tax and social security regulations . Not only that, but in some circumstances the denunciation work done by SI Cobas and Adl Cobas of cases of illegal hiring and forms of slave-type relations led to the opening of judicial proceedings and also to arrests of foremen or private entrepreneurs or related to cooperatives . In the absence of all this the world of logistics would still be a world crossed entirely by illegality and by criminal organizations . This paradox has translated into hundreds of police charges outside the gates , criminal and administrative proceedings, street documents and urban away sheets against workers and trade union delegates who in most cases claim nothing but the respect of national laws and contracts . From this bleak picture emerges , in an increasingly evident manner, an arbitrary , instrumental and unilateral use of the norms of the penal code , aimed at crushing dissent and hitting the most oppressed sectors of our society : a framework that risks worsening further with the recent approval by the Government of the Count Security DL , which , among other things, provides for sentences of up to 12 years for the crime of ” road blockade” ( and , at the same time, immediate repatriation for those immigrant workers who take part in these initiatives ) and whose immediate effects were already made clear with the “militarization” of some delicate disputes, as shown by the emblematic cases of Italpizza in Modena, of the Toncar in Muggiò ( MB ) , and of the DHL of Carpiano ( MI ) , where in these days an impressive pack of police and carabinieri ( a dozen armored vehicles plus a hydrant ) intervened to break the workers ‘ protest against 4 political layoffs . Equally indicative is a recent sentence by the Milan court with sentences of up to 2 years and 6 months against members of SI Cobas and the Vittoria Social Center for a picket a few years ago , which took place without any tension, so much so that the same prosecutor had demanded acquittal for all the defendants , not to mention the hundreds of complaints made against as many workers and activists for private violence or road blockade . Against the struggles in logistics there is a very special repressive fury , but it is not, however, only this sector . The long story that saw FCA sack and persecute 5 Pomigliano workers ” guilty ” of having denounced the serious and even deadly consequences of corporate policies with irreducible tenacity ; the sequence of repressive measures against social movements ( from the No Tav to the struggles for housing) and the climate of intimidation, that is being created in schools against anyone who disagrees with the directives of historical revisionism , tells us that they want to question, in addition to the right to strike and trade union freedoms , every form of social conflict , in every way it is practiced, as well as the most basic forms of self-defense of workers and the freedom of thought and criticism . The judicial case that struck the SI Cobas national coordinator Aldo Milani is paradigmatic from this point of view : a long-term union activist , first arrested and held for three days in prison at the end of a union negotiation on extortion charges to the detriment of the Levoni family ( entrepreneurs active in the meat sector in the Modena area and under investigation for corruption ) , hastily beaten on the front page of the press and media in the same way as a criminal , and now struggling for two years with a grueling trial in which enterprises and cooperatives , dedicated to the intensive exploitation of immigrant and ultra- concealed labor , sit on the bench of the accusers . A process that, during the trial, brought out on the one hand the level of complicity and connivance between private entrepreneurship and central and peripheral organs of the State , on the other the total extraneousness of Aldo Milani to the accusations made. In the face of a situation that takes on grotesque connotations , in the last hearing the PM came to request for the SI Cobas national coordinator a ” reduced ” sentence of 2 years and 4 months, as the latter deserves the mitigation of having acted out of a ” high moral value ” , that is , not asking for money for themselves, but for workers dismissed on strike ” ( ! ) . Beyond the fact that the Levoni dispute had characteristics very similar to an infinite number of other disputes in which the task of the union is to worry about having the workers have all the due for back wages , for severance indemnity and severance pay and possibly forms of economic recognition for the workers in the face of conciliations , on the part of the PM , an attempt is made to criminalize a normal labor dispute, envisaging a very heavy sentence mitigated by the high moral value. This unprecedented attempt to ” reconcile the goat and the cabbage ” by equating a trade unionist with a Robin Hood that ” extorts ” the rich to give to the poor, in our opinion constitutes a very dangerous jurisprudential precedent. Being now also clear to the investigating bodies that Milani not only did not extort money from the Levon is in order to enrich himself , but he did not put into practice any extortion , instead acting in the full of his prerogatives as a trade union representative , putting in place forms of fight and legitimate trade union initiative in order to prevent the dismissal of 55 workers , and above all to guarantee that the latter were paid those fees and those contribution payments that employers unlawfully refused to liquidate , it is clear that a criminal conviction against him can open a deep breach in our system of industrial relations : if every economic and monetary request in favor of workers becomes liable to be classified as a crime of extortion , then the exercise of trade union activity is questioned even in its foundations . At the same time, we ask all the sincerely democratic political, social and trade union forces , the exponents of the legal , academic , art , culture and entertainment world to sign this appeal for the full acquittal of Aldo Milani from the charges brought and to launch a campaign for the total decriminalization of the crime of ” road blockade ” for social or trade union reasons and to sanction the prohibition of the use of swift-departments on the occasion of labor unrest outside the workplace.